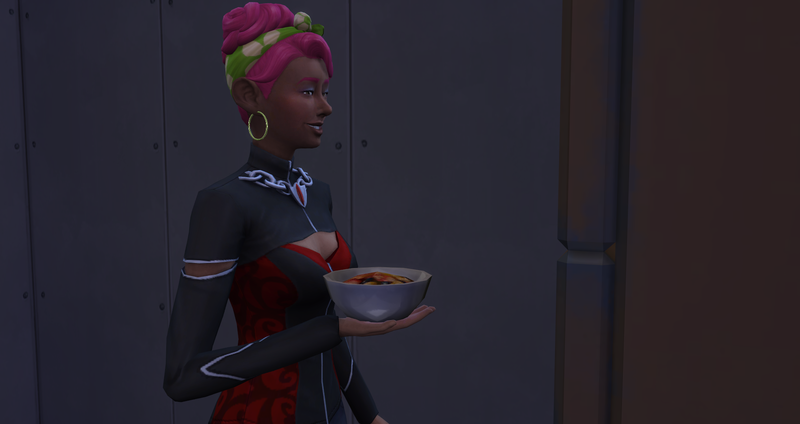 So I haven’t done this random legacy in awhile, and honestly, I forgot the rules I’d made up for it so I’ve been doing a lot of back reading of my own writing. But, I’d kind of been craving the silliness of it again so I decided to play it again. 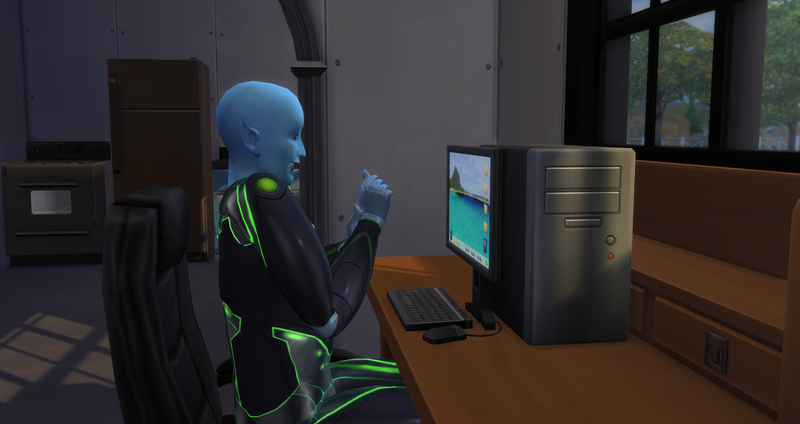 Of course, that meant that I needed to start off by releasing control over either sim for 24 hours. Yeesh… Plus they didn’t roll “travel to a fun place.” Only a few hours left and Gulliver gets a phone call, so I answer it. He’s getting invited out to some Ancient Ruins for a dance party. Hmmm… you know… I can’t find anywhere in my notes what to do if you get a call to go somewhere. So I made the executive play testing decision of… Look there are three options! Roll a d3. (which I happen to own one actually. Cool huh!) Otherwise 1-2 3-4 5-6 for the three options. Or… you know, however, you want to determine the option randomly. So here’s a little checking in now that I’ve updated that rule. Join politician branch – Nope, she’s been refusing to whim for a career. Have a female daughter so she can be heir… Working on that possibility, married an alien. Considering it is only Thursday of week one, I think we’re doing pretty good. Though I wish they would be slightly more interesting on their free will day. They mostly just sat on the computer, ate, and slept. 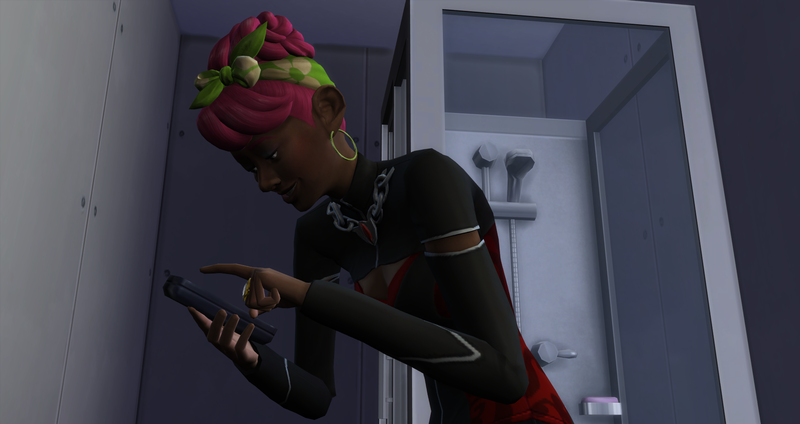 So.. yeah, I kinda took it upon myself to remodel some more because I got inspired to make their bathroom look pretty. 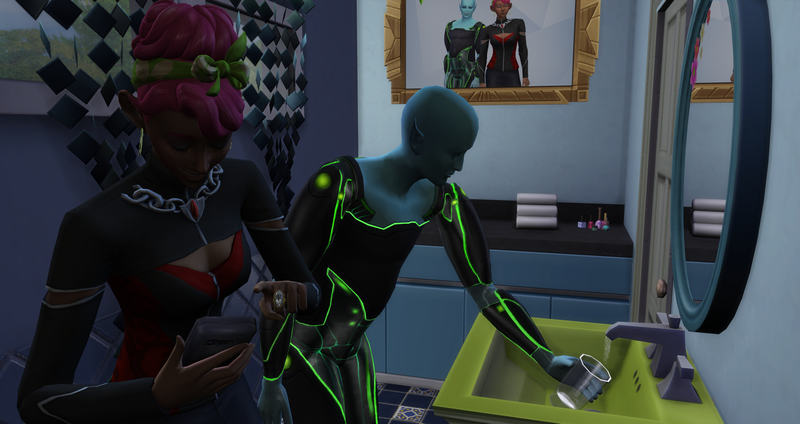 I decided the first bathroom will be mainly blue and green to represent Gulliver, and there are splashes of pink to represent Aimee’s hair. Of course, they also need to have the family portrait in there! This will be the main guest bathroom when they continue expanding the house. I think, so far, it’s looking super cute! 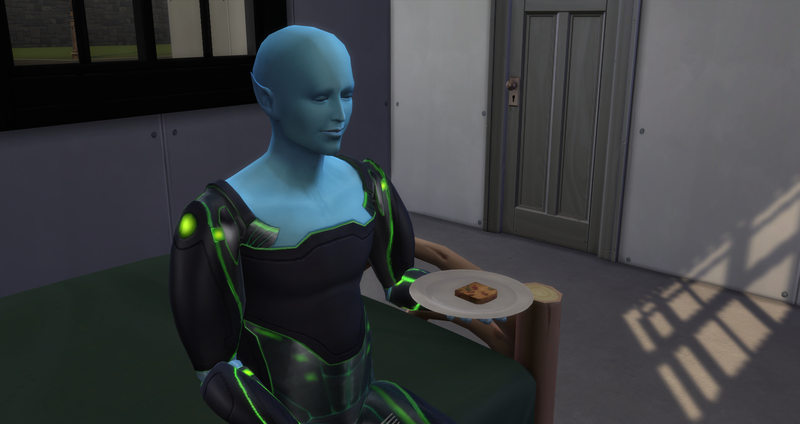 The day started off well, Gulliver got some leftover fruitcake from the fridge. Aimee quickly joined him on the bed with her own slice, and they enjoyed each other’s company in silence. It was good enough just sitting near each other and feeling happy and content in their togetherness. Gulliver sat and listened to something that no one else could hear, and then suddenly he turned to his girlfriend. Which was so sweet and adorable… they decided to take a nap together. Just a nap. A nap where they weren’t even giggling and rawr-ing in their sleep. It was just a nap. When they woke up though, I was hopeful when Gulliver decided to wash the dishes they had left by the side of the bed, maybe they’ll decide to do something interesting! It’s a “let’s level up our video gaming skill!” kind of day. Which I guess is all right, because they’re leveling a skill instead of just sitting around. But it isn’t very interesting to watch when they’re just taking turns on the computer and their phones. Awww more autonomous happy cute couple stuff! He looks so happy to be hugging her! And she’s so in love she closed her eyes!! 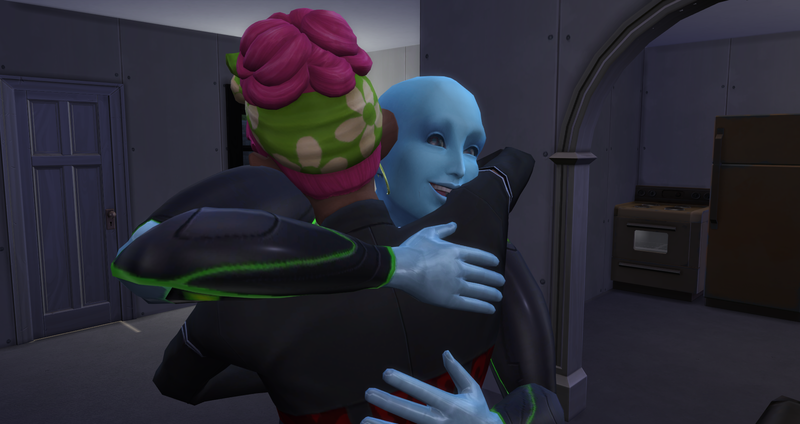 Of course, that was the only hug or conversation because than Aimee needed to go get something to eat. 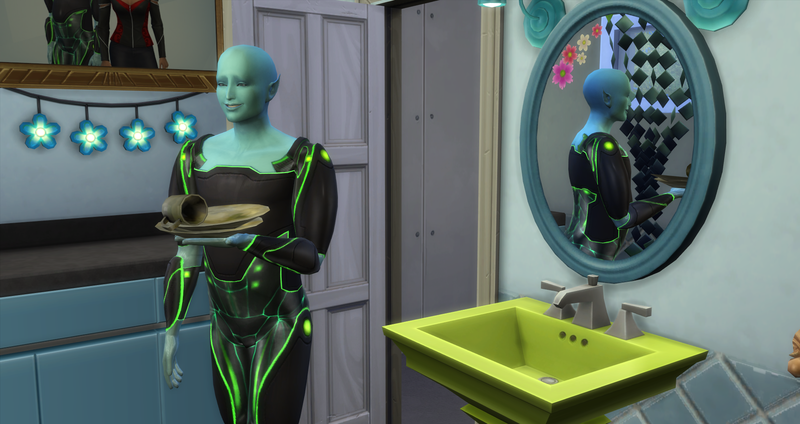 Than Gulliver had to eat and wash his dish than go back for Aimee’s where she left it in the kitchen. (Thank god he cleans, because she certainly doesn’t care about keeping the house clean.) 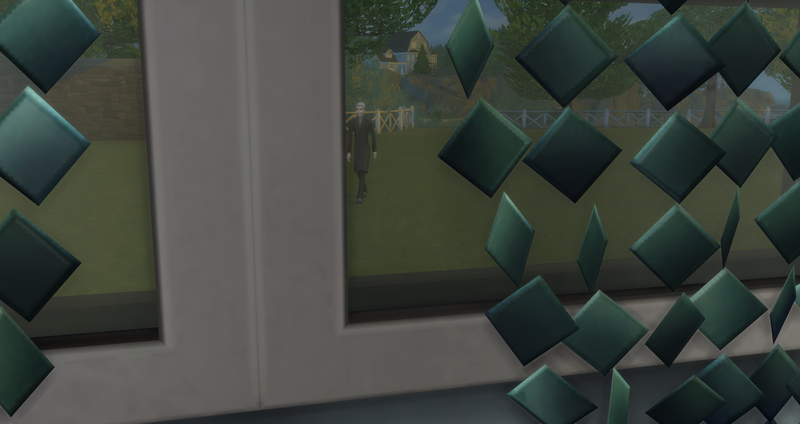 My eye is twitching because i would have the neat trait if I were a sim. 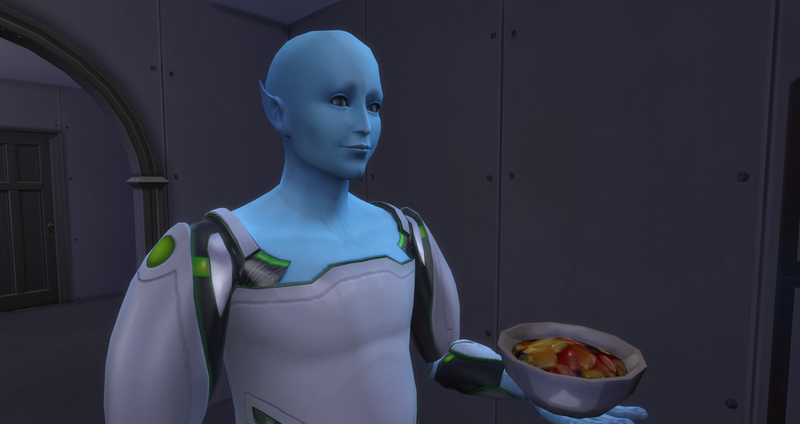 Gulliver continues to win my heart and keeps showing me to look past his negative traits, ( For me, mean and jealous would be negative traits) and look at how sweet and caring and clean he is. His traits do not define him. I didn’t choose him after all. 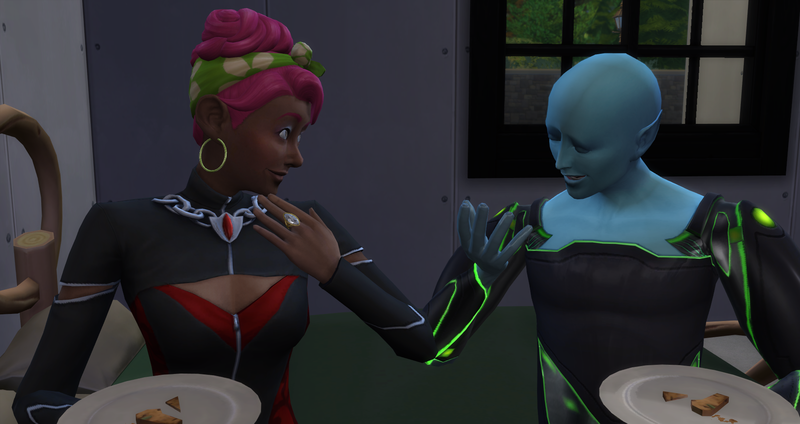 They chose each other, and I want my sims to be happy. And of course, they’re back in bed. Part way through the early morning hours. (Maybe 1 or 2 am) Gulliver gets a text message asking if he wants to go out to a dance party. I roll my dice based on the new ruling I just set up and…! Awww… cancel. Well, that was a boring day. xD Prety much nothing happened, but then again. It didn’t need to. They had a quiet day together. The loners are happy. 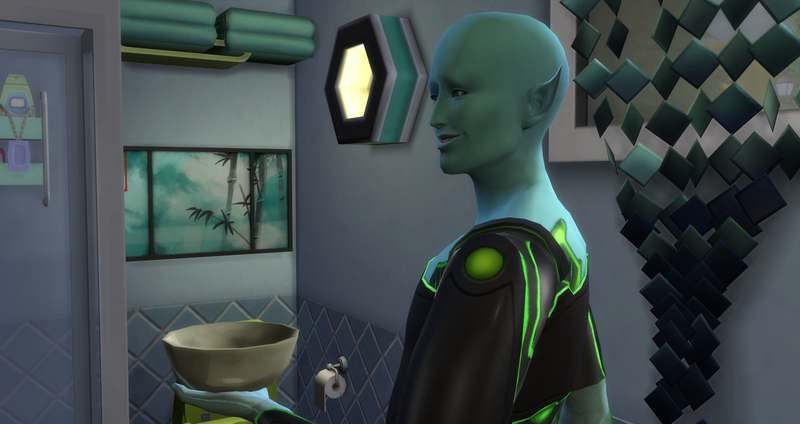 They have a remodeled bathroom where Gulliver likes washing his dishes. They have… Who is that walking across their lawn as Gulliver has gotten up to go to the bathroom? Oh no. *looks at clock* 7:16 Am. oh gosh, the time is almost up where I can control one of them. Vlad get out of here!!! 4 – even. Aimee it is. What are we going to do *rolls* 6. Travel somewhere fun! Gee.. I seem to roll that a lot. Now please, let us just survive this interaction with Vlad long enough where I can take control!